This week’s passage is a favorite of mine, Psalm 37:4-6. The Seeds song is called “Delight,” track 7 on “Seeds of Purpose.” Again, these songs use the 1984 NIV translation, and the current NIV was pretty different, so I’m pasting the ESV translation here. I was in college when I discovered Psalm 37:4. At the time it seemed like God would make all of my dreams come true if I would just worship more or read the Bible more or something. I was very excited about the desires of my heart (which was boys, btw! ), and not maybe as excited or informed about truly delighting myself in the Lord. Looking back at the time between then and now, I have learned a few things about this passage (and I hope that I will continue to learn even more). 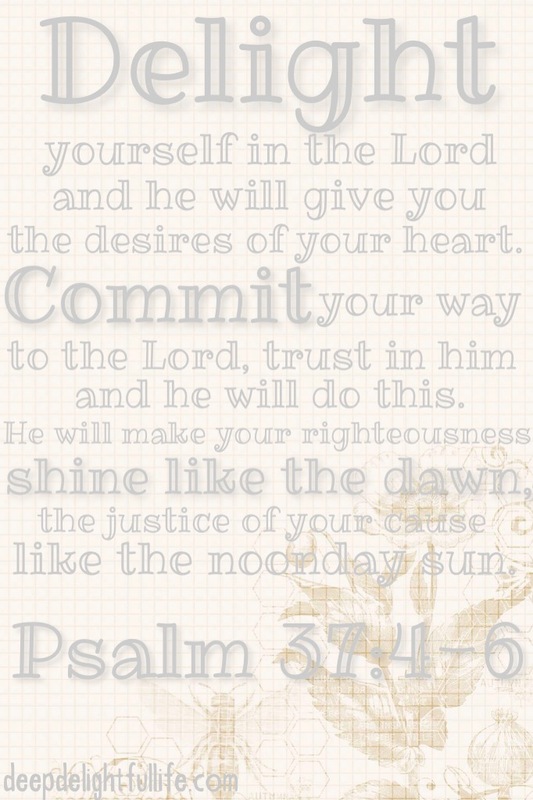 What I see from these words now is that to delight in the Lord is to commit my way to him and trust him. Verse 4 is tricky because on the surface it sounds like God is a wish-granting genie. But looking at the rest of the passage and Bible as a whole, we know this is not true of his character. There are some desires in my heart that are not the most godly. While I do really want my character to reflect more of Christ, I would also like to have fancier clothes or furniture, or more spending money. I have actually received many of those things at different times in my life, but if I’m honest they have not done much for my heart. As I commit my way to the Lord I start to see that the things that grow my heart are what I really want from God. He has shown me that he is trustworthy, and as I have stepped out in faith, I have seen him act. I have also seen him bring forth righteousness and justice in my life as I trust and obey. And when that happens, it’s clear that it is God’s gracious and mighty hand working in spite of myself. The title of Psalm 37 in the ESV is “He Will Not Forsake His Saints,” and it is full of wisdom and truth. I would encourage you to check it out, and certainly to meditate on verses 4-6 with me this week. I should add “dragging words around on the screen of your phone” to my list of memorization techniques! I used the Rhonna Designs app to make this image. Verse 4 can be tricky at times. I have to remind myself that if I am delighting myself in the Lord (committing to His ways), then the desires of my heart gradually change to be more godly. Often after that, I am surprised by the blessings that God lavishes upon me, things/situations I never expected. I wish I could say that I’ve got this down, but it is something I have to continually revisit. I have had that same experience of surprise when I realize what God has done for me. But the “delighting” is a process, for sure.